This is a brand new Bolt On Spring Solo Seat Mounting Kit for the 2000 and Up Softail Models! It is 100% bolt on and Made In the USA. This kit includes a black formed leather ECM Cover. The hinge is a heavy cast steel. The 2" Springs are Chrome Coated. 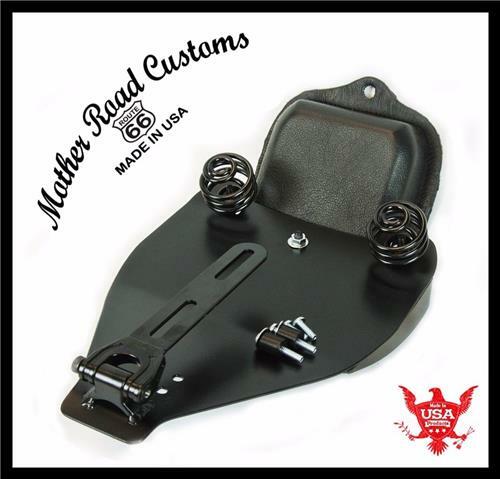 Now 2000 and Up Harley Softail owners can mount a spring solo seat to there bikes without modifications! The kit also included coil springs and necessary mounting hardware, a steel powder coated hinge. Seats are sold separately. Any of my 13x15", 11x16" and 15x14" tractor range seats with 7" rear bolt spacing will work with this kit.